Everyone has a favourite colour. I've associated myself to blue ever since I was a kid. It all started in school when I somehow ended up being part of the blue house. It's the colour that defined me over the years. T-shirts, watches or even sunglasses, it had to be blue. It's not just you or me; many auto manufacturers too tend to favour a particular hue. A Ferrari is respected in red and a Kawasaki in green. There are no two ways about it. That's one part of the story. Now to the second part. I steer towards the ideal entry point on turn 3 of the Buddh International Circuit. It's a blind corner. The steering is precise and the sharp right hander is taken spot on. Half throttle till the wheels point straight and it's the 1.06km back straight in my view. The second longest straight in the Formula one calendar begs me to unleash the car's raw power. Pedal to the metal then and I'm instantly pushed hard against the seat. The acceleration is mental and literally gives me goose bumps. After all, the car claims to reach the hundred mark in just 4.4 seconds. The double-clutch gearbox offers seamless shifts all the way up at 7200rpm. 200kmph is reached effortlessly with more than 400 metres left on the straight. I quickly look at the speedometer before stepping on the brakes and it reads 230kmph, some more road and the car could have eventually hit the 250kmph mark. Braking hard for the first corner and you're held on tight by the seatbelt under massive g-forces. Huge 400mm high performance brakes that are larger than a Gujarati thali plate ensure the car stops in no time. The front end displays excellent front-end grip and no understeer. The next few turns, especially the left into right and right into left corners, I can feel my brain swell as I fight the sideway forces. The tyres are sticky and offer excellent grip and extract the most out of the 560PS machine. Since the car is putting out all its power via its rear wheels, it loves to swing its tail wide and one requires a quick helping of opposite lock to keep the car pointing towards the desired direction. Back on the throttle on the main straight this time and the gear shifts and the exhaust note continue to arouse you. Before you know it, you're on the back straight again. It's time then to go repeat the process through every turn and get into serious track mode. After what I just said, you may think that I was driving a sports car. Yes you're right, 10 points for that. But it's a sports car in the guise of the very same car that chauffeured me from the hotel to the race track. It's the all-new BMW M5, the super saloon that's based on the sixth generation BMW 5 Series. The 5 saloon was launched last year and it was obvious that the new M5 would follow soon. The engine is the heart of any car but in an M car, it transforms a road going BMW saloon into an angry sports car just like Bruce Banner turning into Hulk. This transformation has been happening since 1984 when the first M5 was introduced. The car went on to create a new super saloon genre by slotting in an engine from the M1 supercar into a 5 Series, this made it the fastest production four-door in the world. Subsequent generations of the M5 also had very powerful engines but the configuration kept changing. The earlier models were equipped with straight-sixes, a rev happy V8 and in the previous version an even higher revving V10. The current car moves back to a V8 by borrowing the engine from the X5M and X6M SUV making this is the first ever turbocharged M5.The 4.4-litre twin-turbo engine produces a maximum power of 560PS at 6000-7000rpm while a whopping 680Nm of torque is all yours from as low as 1500 up to 5750rpm. This is the most powerful M5 ever period. BMW's TwinPower Turbo technology has also meant that the fuel economy has improved by 30 per cent over its predecessor. A claimed figure of 10.1kmpl and an 80-litre fuel tank means one can comfortably travel long distances. So, the M5 is a proper sports car judging by its performance and handling. A super saloon however offers something a sports car can't dream of - space for four adults and their luggage. Step inside the M5 and one is greeted by exactly the same cabin as the 5 Series saloon. So an enormous boot, comfortable rear seats and cleverly placed cubby holes make the M5 a practical car too. All Ms are two cars in one but this M5 takes it to a whole new level. The steering feel, suspension setting and throttle response can all be independently adjusted and are offered in three modes  comfort, sport and sport plus. I preferred everything set to sport mode on the track but if one prefers something different, you can save a customised setting and have it selected anytime by just pushing the M button on the steering wheel. Since there are two M buttons, you can have two completely different programs saved. One program could be for the track and the other for regular road use. Clever. The 5 Series has always been sportier than its competition, the M division however have added subtle changes to make the M5 a sportscar with four doors. The front bumper features three large air ducts that not only look like it's from a race car but also helps in feeding a lot of air to the radiator. Viewed from the side, the front fender gets a typical side vent with M badging but the new M5 also gets an LED indicator that splits the vent. The car we drove came with optional five-spoke 20-inch wheels that look they've come straight out of a supercar. One look at the rear and you know the M5 is a seriously fast car, the trademark quad exhausts and diffuser are responsible for this. The small rear spoiler goes unnoticed at times. With the practicality of a four door and the performance of a sports car, the M5 is the perfect recipe of the ideal car. Now back to the first part of my story. My obsession with the colour meant that the cars and bikes I owned were all blue. There was a particular shade of metallic blue that I insisted on being sprayed on all my vehicles (including dad's cars). It even has its own name, 'Halley Blue', in a small paint shop in Bangalore. 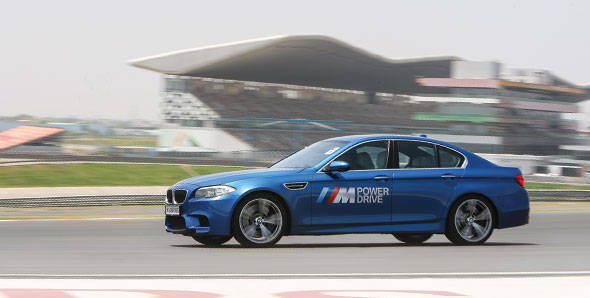 Taming the M5 around the BIC was an unforgettable experience but it all started when I saw the car that was assigned to me. It was metallic blue. This is the first time that the M5 is available in my favourite colour. BMW call it 'Monaco Blue' but for me it's still 'Halley Blue'.